Thanks for purchasing Podcast Chapters, I really appreciate your support, and I hope you've found it useful so far! I'll be releasing updates here and there to add features and fix bugs. You can find a list of the changes so far on this page. A very small version to mark the transition of developer for the app. Bug fix: Hopefully fixed a crash which could occur if a podcast was opened including a chapter without a title. This is our Mojave release, with support for Apple's latest version of macOS. 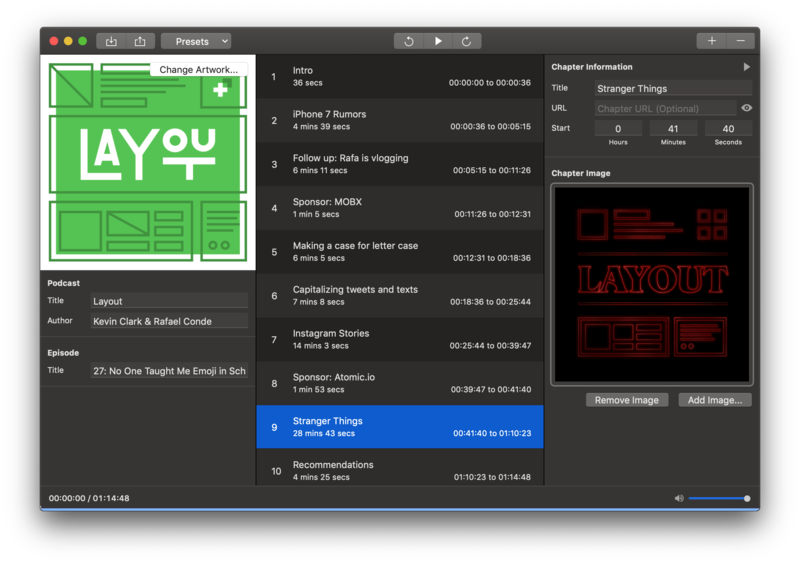 Dark mode: Now you can finish up your episode late into the night, with support for macOS Mojave's dark theme. Accent colors: With macOS Mojave, you can use red, green, even pink as your system accent color, and now, whether you're sticking with good old blue, or making your Mac your own, Podcast Chapters will be right there with you. Bug fixes: We fixed a few bugs in this release, including an issue with dragging images into your chapters. In this minor update I've fixed a bug that showed up in the 1.3.1 release. 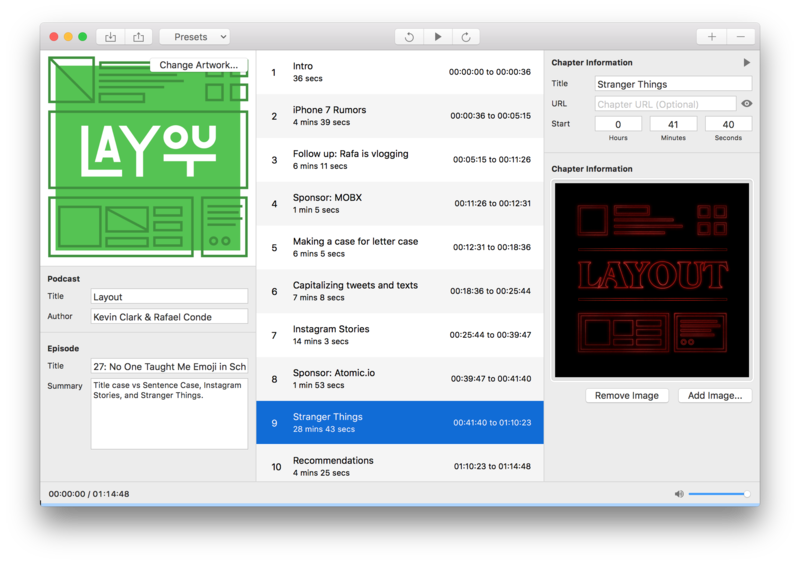 Cover images now work properly in Finder and iTunes. In this minor update I've fixed a couple of bugs that managed to creep through in the 1.3 release. Some of you reported that playback wasn't working for you. It should be fixed in this build. Fixed an annoying crash when using UTF-8 characters. Fixed an occasional crash when opening a podcast. This update simply would not have been possible without the incredible work of Fredrik Björeman, who ported the entire app to Swift 3. This was no small task, and I'm incredibly indebted to him. In this update, Podcast Chapters gets a couple of new features, and fixes a few bugs that managed to creep through. Drag-and-Drop: Fredrik has gone through and enabled drag-and-drop all over the app. You can now drag images onto the cover art or chapter image areas, saving you from using the file picker every time. Export Chapters as Cue Files: As of Podcast Chapters 1.2 you could import chapter markers from cue files. Well now you can export to them as well! Note: Cue files only allow for a title and a timestamp, so unfortunately any URL or images associated with the chapter aren't exported. Export Chapters to Show Notes: You can now export your chapter markers in a show-note-friendly text format, perfect for listeners who don't have a client that supports MP3 Chapter Markers. Dismissing the import dialog panel would crash the app before (thanks to Daniel Oskarsson for sending me their bug report). The eagle-eyed among you might've noticed that 'Chapter Images' was incorrectly titled 'Chapter Information' in the last version. We've fixed that. The minimum macOS version in this update has changed to macOS Sierra. In this big update, Podcast Chapters gets a ton of new features, helping you with that annoying last part of the podcast process. Metadata: Podcast Chapters now lets you update all other kinds of MP3 metadata for publishing your podcast, including the name of your podcast, the episode's title, and your show art. Presets: You can now save a preset for a show, letting you quickly and easily fill information about the podcast, without having to find the pesky show art each time. Import Chapters: You can now import your chapters from cue files. Chapter Artwork: You can now add artwork to a chapter marker! Give it a try! Annoying text encoding bug (thanks to Preben Friis of Hindenburg Systems for helping me debug this). A number of VoiceOver bugs. In this release, Chapters has been renamed Podcast Chapters. Podcast Chapters now works nicely with VoiceOver. 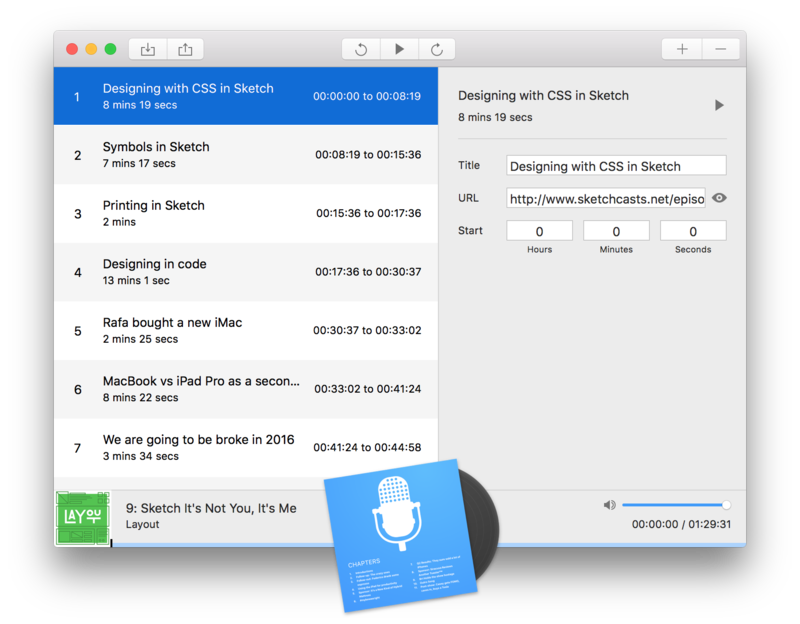 Podcast Chapters will now convert your MP3 file to use ID3 v2.3 tags. No more messing around in iTunes to change the tag versions! Podcast Chapters will let you overwrite files now. Sorry about that. Podcast Chapters has received some minor visual touchups, to make sure your experience is just that much more polished.